Covestro and g4g are working together to help inspire the future leaders of STEM! In June of 2015, our global partnership began with an inspiring mission to get more girls in the STEM fields across the world. Since then, we've launched together in Covestro's headquarter city of Pittsburgh, PA, as well as in Houston, TX, crossed seas to New Delhi and Mumbai (India) and took on one of the biggest cities in the world: Moscow, Russia! In addition, Covestro and g4g collaborated in Brussels and Barcelona for our signature "g4g Day" events, allowing girls to become "Covestro Future Scientists"! Together, we link science to the innovative materials technology Covestro is renowned for, especially with hands-on workshops that demonstrate the fun in polymer chemistry. All this and more with one incredible team to show us how curious, courageous, and colorful the future can be! Take a look at the cities we already brought our events in with Covestro! We were thrilled to launch our first event in São Paulo, at the Catavento museum! Bringing together 80 girls from various communities and backgrounds we spent the morning exploring STEM! In Mumbai we didn't just have a g4g Day... but a g4g Week! During this period, over 1300 girls experienced fun, interactive workshops related to STEM! In October 2017, we teamed up with Covestro to organise a g4g Day in Moscow, in the context of the annual Science Festival Nauki. 100 girls got the opportunity to experience everyday science and technology through fun workshops. We are always looking for like-minded partners who endorse our activities in countries all over the world, so it’s fantastic to have a global company like Covestro on board. It’s scientists, technicians, strategists, and marketers that can provide first-hand experience of what it’s like working in an innovative and forward-thinking environment, and can demonstrate how rewarding it is being involved in the exciting world of science. In May 2017, we welcomed 250 girls from local communities for a g4g Day at the Houston Space Center. Not only did they have an amazing day full of STEM inspired workshops, they also got to be astronauts for a day! 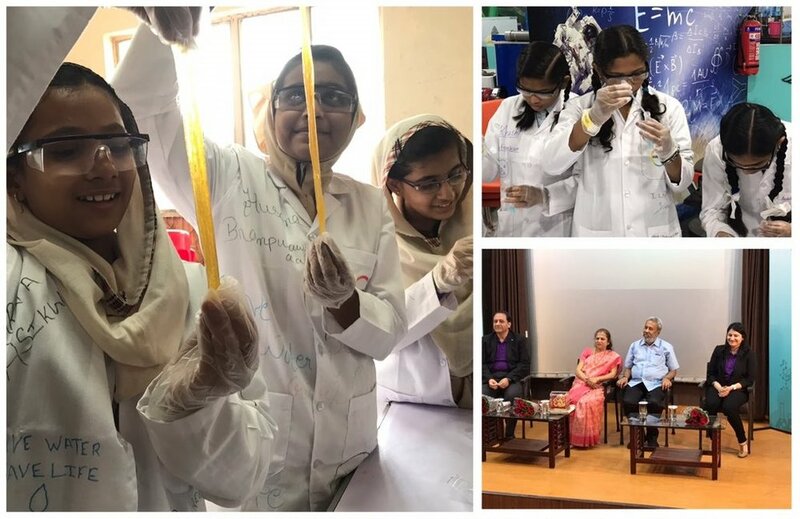 In October, Covestro and g4g had the pleasure of crossing seas to launch and inspire 100 girls in New Delhi, India! The special day was commemorated by a special visit from the CEO of Covestro, Patrick Thomas, in person! Click here for the full album! In May, Covestro joined us as we launched g4g Day in Barcelona! Thank you Eva Tejada and Berta Vega Sanchez for coming and inspiring greenlight girls in Barcelona with polymer fun and reminding us that Anything is Possible! In February 2016, we hosted one incredible launch inspiring 125 girls with the dedicated Pittsburgh team, one famous chef-scientist, Covestro President Jerry F. MacCleary, The County Councilman and the Mayor of Pittsburgh making it all official! Click here for the full album! We are keen to fire up the interests of girls of all ages and backgrounds in STEM subjects, particularly in developing countries where they might not have the same opportunities as their counterparts in other parts of Europe and the world. This is why our goals are perfectly in line with those of g4g, which has a clear passion for instilling confidence in girls, and encouraging them to share in the fun of science in all its forms.